Lexikon-Sonate is a work in progress which was started in 1992. Instead of being a composition in which the structure is fixed by notation, it manifests itself as a computer program that composes the piece - or, more precisely: an excerpt of a virtually endless piano piece - in real time. Lexikon-Sonate lacks two characteristics of a traditional piano piece: 1) there is no pre-composed text to be interpreted, and 2) there is no need for an interpreter. Instead, the instructions for playing the piano - the indication "which key should be pressed how quickly and held down for how long" - are directly generated by a computer program and transmitted immediately to a player piano which executes them. In this paper I will describe from where I started and how I arrived at the concept of an infinite interactive realtime composition. In the late sixties the Austrian/Slovakian poet Andreas Okopenko started to write the novel "Lexikon-Roman" (Okopenko, 1970) - apparently the first literary HyperText, several years before this term was introduced by Ted Nelson. This novel - "a sentimental journey to a meeting of exporters in Druden" (subtitle) - consists of several hundred small chapters which were brought into alphabetical order. By reference arrows as in a lexicon the reader could make her own investigations through the multiple nested web structure of the text. Instead of presenting a sequential text with a predefined direction of reading, Okopenko provides a structure of possibilities, which challenges the reader to become a creator of her own version of this novel. More than twenty years later an interdisciplinary group of artists and media designers called "Libraries of the Mind" started to create an electronic version of this book using HyperCard as a programming environment. Now the navigation through the text was easily achieved by clicking onto the reference arrows, the "links". This electronic implementation - the so-called ELEX (electronic Lexikon-Roman) which manifest itself as a CD-ROM - also provides new features that were impossible with a printed book: an electronic logfile which keeps track of the ways and deviations of the reader, search for keywords, the possibility of making annotations etc. Andreas Okopenko, who himself belongs to the "Libraries", suggested adding other media like pictures, photos, spoken language, music and sound. And so other artists joined the group: a graphic artist, a photographer, and at last myself, a composer. 1) Music for the "Lexikon-Roman" cannot merely consist of "jingles" which are played whenever a certain text particle has been selected. With music the problem of time emerges: music - unlike a static pictorial object or even a text - is always related to time: it takes place "in time", whereas beholding a picture or reading a text happens "out of time". One can meditate over a poem for a long time, or just read over it. But music is always linked to a certain time span, reflecting time. So it became clear that the music cannot consist of pre-recorded pieces that are simply recalled. It should reflect the reading behavior of the reader: if she spends a long time on a chapter, the music should stay in the same "mood" or character, and if she starts zapping nervously between the textural links, this should also be reflected by the music, resulting in quick changes of character. 2) The complex structure of the novel challenged me to achieve something related in musical composition: a complex network of musical meanings, an infinite maze of sounds. 3) The lexical principle of references - starting at a certain point and arriving somewhere else by reference arrows - gave me an idea of the formal aspect of the composition. If the music changes, this change should not be abrupt, but taking some aspects of its former state and perpetuate it, while something new is added. Consider you are making a transition from A to B to C - for instance, when you are reading an encyclopedia starting with the keyword "A" which leads you to "B" by a link, and from there to "C". There is a semantical relationship between A and B, but to a lesser extent between A and C. When you are in the B state, you will still remember A which provided the reference; and when you approach C, A will still be present, but only to a lesser extent. If you dare move towards D, you will probably forget about A. Indeed, this lexical concept of links is the underlying formal principle of Lexikon-Sonate. I confess that I have serious problems with the piano. As a composer and a double bass player I am mostly interested in sound processes, whereas the piano does not offer much flexibility in sound production: once the key is pressed, nothing can be done to shape the sound afterwards, as opposed to a bowed instrument, for example. On the other hand, the piano has a big advantage: as a polyphonic instrument it allows different voices to be played at the same time. Due to its equal timbral characteristic it is predestinated to represent the structure of traditional music. In this respect it was utilized during the last 250 years. Before the development of radio and records, piano transcriptions were used to obtain an acoustical impression of a symphony or opera. The decision to write a piano piece can also be seen in another light: taking revenge for the piano lessons I had to take since my early childhood. Using a piano also implies awareness of its incorporated history: its role in the bourgeois salon, as an inspirational tool for a composer, and as a handy instrument to unload emotional energies. At last: writing for the piano means to reflect on the whole history of this instrument, its repertory, its highly developed virtuoso techniques and its typical compositional subjects. Writing a solo piece for this beloved and hated instrument must result in a "hyper"-piano piece which increases its historical, social and compositional implications; a music beyond the scope, virtually never-ending, which exceeds the facilities of a human player. A composition, that can only be executed by a computer-controlled piano. For a long time I have had a vision of an infinite music which is "composing itself" without lacking a personal style and interesting flavor. I had some theoretical ideas about how to achieve this goal, and I even developed a set of playing rules for the performance project Partikel-Bewegungen (1991 ff.) for flute, bass clarinet and saxophone which was composed for a series of performances with Harald Naegeli, the "Sprayer of Zurich". In this piece each musician plays an independent, graphically notated part which was generated and printed by a computer program written in my own xLOGO-based "Computer Aided Composition Environment" which I have been developing since 1988 (Essl 1991). Each class of graphical signs can be interpreted according to a certain set of rules, which only gives a rough outline. The "fine tuning", however, is achieved by the musicians themselves during the performance - in real time - by listening to each other and coordinating or even juxtaposing their playing with the sounds of the others. When I started to work on a commission at IRCAM in 1992 (Entsagung for flute, bass clarinet, prepared piano, percussion and the IRCAM Musical Workstation), I came across MAX, a "graphical development environment for multimedia and music" (IRCAM/ Opcode). Immediately I realised that this was the very programing language I was looking for since a long time - a powerful tool which allows to experiment with compositional strategies and to listen to the result immediately. First I started to re-implement some objects which already existed within my own xLOGO-based "Computer Aided Composition Environment", like specialized random functions and rhythm generators. The realtime facilities of MAX offered me the fantastic possibility of rapid prototyping and refining after listening, whereas in my xLOGO-environment a transcription into musical notation had to be done. The result was so compelling and encouraging that I began to implement some models for algorithmic composition, which later became the starting point for Lexikon-Sonate. As a side-effect a whole library of compositional tools - the Real Time Composition Library (RTC-lib) for MAX - evolved, which is available from several ftp-sites (see appendix). This library offers the possibility to experiment with a number of compositional techniques, such as serial procedures, permutations and controlled randomness. Most of these objects are geared towards straightforward processing of data. By using these specialized objects together in a patch, programming becomes much clearer and easier. Many functions that are often useful in algorithmic composition are provided with this library - allowing the composer to concentrate on the composition rather than the programming aspects. Regardless of the fact that this library was conceived for a particular project it became more and more obvious that its functionalities are open and generic enough to be used by other composers in different compositional contexts. Although the theoretical point of view of the library is based on paradigms which have been extracted from serialism and its further developments until today, it does not force a single aesthetic, but provides a programming environment for testing and developing musical strategies. "Serialism" here refers to a certain method of musical thinking rather than orthodox dodecaphonic techniques which has been abandoned by serial theory itself (cf. Stockhausen, 1957 and Koenig, 1965). The library is composed of two main categories of objects: basic programming tools (like toolbox functions, chance and list operations) and specific musical functions (harmony, rhythm, envelopes). Clicking on one of the boxes (like "Toolbox") will show you its content and provides you with further information. As an example I will discuss the "group-rhythm"-object which generates a rhythmic structure according to Stockhausen's "Gruppen"-theory (Stockhausen, 1957) and takes into account the concept of "periodicity" as it was formulated by Gottfried Michael Koenig (Koenig, 1965). These concepts indicated the end of the orthodox "punctual" serialism and finally led to the abolition of row permutation techniques. Instead of a permutation program which was derived from a given basic row, Koenig introduced the method of random selection as it manifestates itself first in his Streichquartett 1959 and later in his composition program Project 1 (Koenig, 1970 and Essl, 1989). When "group-rhythm" is switched on, it chooses an ED-value by chance. Now the "periodicity factor" determines how often this value will be repeated, before another one is chosen. When the factor is 1, the resulting rhythm will be completely periodic - an even pulsation. If the periodicity factor becomes 0, a completely aperiodic rhythm with no repetitions of a chosen ED is generated. In between these boundaries of pure "periodic" or "aperiodic" rhythms a broad field of interesting intermediate steps is situated. By gradually changing the periodicity parameter over the time, transitions between different grades of (a)periodicity can be achieved easily. These specialized generators of the RTC-lib are functional implementations of a certain algorithmic model whose "behavior" can be changed by the model's parameters. In this way an infinite variety of variants can be produced, which are always linked to the central idea of the model, even when the results are very different. Combining different RTC-generators in one patch, is a convenient way to implement specific algorithmic compositional models, as will be shown in the following chapter. Up to now the Lexikon-Sonate consists of 24 music-generating modules (structure generators) which are related in a very complex way. Each module generates a specific and perceptual characteristic musical output (a "language") due to a certain compositional strategy applied. A structure generator represents an abstract model of a certain musical behavior. It does not contain any pre-organized musical material, but a formal description of it and the methods how it is being processed. The idea of autopoiësis - material organizing itself due to specific constraints - plays an important rule. By using different random generators which are controlling each other (which - serially thought - form a scale between a completely deterministic and a completely chaotic behavior) new variants of the same model are generated. Variants may differ dramatically from each other, although they are always perceptible as "instances" of the given structural model. This module generates melodies with a pronounced "espressivo" character. Before investigating what "espressivo" means and how it is achieved let us first look at the flow diagram of this patch; a basic structure, that appears in nearly all structure generators of Lexikon-Sonate. phraser - alternatively generates phrases (AD = "Aktionsdauer") and pauses (PD = "Pausendauer") of a certain length. The concept of "Aktionsdauern" (time filled with sound) and "Pausendauer" (empty time, without sound) was developed by Karlheinz Stockhausen (Henck, 1980) in order to control structural "density". In Lexikon-Sonate the statistical time proportions between AD and PD are controlled by a so-called "weight factor", an integer between 1 and 3. In other words: the weight factor determines the perceptual level of a structure generator - whether it is dominantly playing in the foreground, being modest in the middle ground, or hiding itself in the background. parameter - before generating a new phrase, all parameters of the structure generator are randomly changed within pre-defined boundaries. With this new set of parameters rhythm, harmony, dynamic and duration are calculated. rhythm - generates a sequence of rhythm pulses ("bangs", in the terminology of MAX) during the length of an AD. Each of these rhythmic bangs marks an entry point of a note whose parameters of pitch, velocity and length are calculated by the harmony-, dynamic-, and duration-objects. In ESPRIT, the group-rhythm object, as discussed above, is used (see Fig. 3). harmony - a rhythm "bang" sent to the harmony object causes it to generate a pitch. In ESPRIT, the harmony algorithm uses the random generator brownian which selects a number within defined boundaries (min, max) according to a brown factor. With this factor (a real number between 0 and 1) the statistical distance between consecutive values is determined - the "Freiheitsgrad". In order to filter out tone repetitions, octaves, and oscillating pitches, the resulting stream of pitches is evaluated by two objects, anti-octave&prime and anti-bis&osc. If such an undesireable event were about to take place the pitch is suppressed and brownian is asked to supply another one that fits into the constraints. This method avoids disturbing musical effects of a not-so-smart harmonical algorithm. dynamic - uses brownian to generate velocities between boundaries that are defined by the parameter object (see above). Due to the fact that the velocity value depends on the value chosen before (according to the "brownian factor") envelope shapes like crescendo, decrescendo can occur. duration - uses brownian to determine the length of the note. By this the articulation ("phrasing") of the melody is controlled: whether a phrase is comprised of legato, portato, staccato, pedal effects etc. or any combinations of them. play - combines pitch, velocity and length into a MIDI note message which is sent to the MIDI-controlled piano. Although the music generation is achieved by random operations, it will never sound like this. In rhythm the repetitions of values create "islands of periodicity" within a complex (chaotic) situation; whereas in harmony, dynamic and duration the randomness is controlled by the "brown factor" leading to the emergences of melodic cells, envelope shapes, articulated phrases etc. By this the desired "espressivo" character - with its association to Viennese music since Mozart until Schoenberg, Webern and Berg - emerges; not at will, but as a consequence of a particular compositional strategy. 4.1. The 24 Structure Generator of "Lexikon-Sonate"
In the following all structure generators are listed, together with a short description; furthermore their relationship to the 5 types of musical structures and references ("cf.") to other modules with similar properties are given. Arpeggios of 4 to 11 notes, ascending or descending, which are built up of 2 - 4 different intervals. 1-6part chords on a brownian rhythm. The harmonic structure is built of intervalic rows. "Clouds" of fast moving notes ("rubato rhythm") within a certain pitch range. Some notes are highlighted by dynamic accents. Espressivo-melody of some complexity, referring to the so-called "Viennese Espressivo". Inserts global pauses into the whole musical stream and sustains the notes at these "cutting points" as resonances with the sustain pedal. Grace-note figures with crescendo towards the main note. Glissandi, composed of minor and major seconds which are sustained with the pedal. Entirely stops the stream of music. By this the whole infinite process of music generation will be organized in sections. Parameters organized in "Gruppen" according to serial theory (see above). Each of the structural parameters rhythm, harmony, dynamic range and duration factor obtain their own, individual periodicity factor which determines whether the respective parameter value is being kept for a longer period ("periodicity") or is changing immediately ("aperiodicity"). Interrupts the global stream of music by inserting short breaks (statistically shorter than FERMATA). Periodic rubato-rhythm with constantly changing registers and generally loud dynamics. The harmony is built up from a supply of two intervals. Music obtained from a radical choice approach: for each section values from predefined parameter supplies are chosen (by the selection principles ALEA, SERIES or SEQUENCE) to build up a musical structure. For each phrase different sequences of parameter values (for rhythm, harmony, dynamic and duration) are calculated which are "looped" for the duration of this very phrase. By this method the concept of "motives" (as it traditionally appears in rhythmical-harmonical contexts) is extended to other structural parameters. A repeated note which is dynamically increasing and decreasing. Simply does nothing at all. Like GENERALPAUSE, HACKER and FERMATE it allows that only two different structure generators are combined, instead of three. Parameters changing each note ("Punktuelle Musik"). Parameter ranges and row sizes may change. Up to 6-part chords on a constant rhythmical pulsation of different speed. The harmony is built of intervalic rows of different sizes. Layers of repeated notes of different speeds which are dynamically increasing and decreasing. The harmonic structure is composed of two or three different intervals. Melodic line of complex rubati with moving harmonic constellations. Repetitions of a single note with increasing or decreasing speed with crescendo or decrescendo. Most of the time it does nothing (like PAUSE), but sometimes it plays a short melodic phrase. 1 - 4part legato-chords on a constant pulse which is structured by rests. The harmonic structure consists of intervalic rows where several note may occur in the next chord (harmonic "suspension"). Thrills of 2 - 6 notes, dynamically increasing and decreasing, mostly together with accelerando or ritardando. NB: A six-note thrill consists of rapid permutations of six notes within a single octave register. A variant of ESPRIT which is only composed of fast rhythmical values would give us the same impression as a structure generated by CLOUDS. A phrase of BROWNCHORD which only contains chords of chord size=1 could be similar to a melodic phrase generated by RÊVERIE. A thrill of six notes (a permutation of a set of six notes within an octave) could be similar to a structure generated by CLOUDS. This shows that those structure generators are not closed entities with an exclusive behavior - they are linked to each other in a very complex way by references. When modules are being combined during the piece, they are acting completely independent of each other. They don't "know" what the others are doing. Hence, by the process of perception the listener will relate some structural aspects of different modules to each other, composing her own "version" of the piece. This approach, as it is viewed by "Radical Constructivism" (Essl, 1992), entitles the listener to become a "composer" - constructing the piece in her mind by finding an individual way through a polyvalent maze. A way, that is determined rather by personal criteria of the observer than by objective structures. During the piece up to three different structure generators are combined whereas each of them occupies a different "weight". This weight factor will determine the statistical proportions between "Aktionsdauern" (time filled with music) and "Pausendauern" (empty time) of a structure generator, as it was shown before in the discussion of the "phraser"-object of the structure generator ESPRIT. In other words: the weight factor determines its the perceptual importance. When combining structure generators in Lexikon-Sonate, there will always be one in the "foreground" (weight = 3), one in the "middle ground" (weight = 2), and one in the "background" (weight = 1). The weight for each module will change whenever a new one is brought into the game: e.g. a "foreground" structure could turn into a "background" or the "middle ground" into the "foreground" etc. The combination of structure generators takes place in a chain of three boxes, which is filled by the chosen modules, from top to bottom. On the right side of each box the number refers to the weight of the position. In the example shown below, the first box always occupies weight 3 (= foreground), the middle 2 (= middle ground), and the last 1 (background). For example, imagine ESPRIT has been chosen. It is being put into the first box to which the weight=3 is associated. Hence, ESPRIT will be played as a foreground structure: long melodic phrases, interrupted by short pauses (see above). After a certain time the next structure generator FIGUREN is selected. Now ESPRIT will be transferred to the second position, which holds the weight 2, whereas FIGUREN will be played as a foreground structure with weight 3. The "influence" of ESPRIT becomes weaker, being displaced by the recently entered FIGUREN. Finally, BROWNCHORDS enters the scene, taking over the foreground. ESPRIT is turned into the background, and the weight of FIGUREN is decreased. When ARPEGGIO is put into the chain, ESPRIT is abandoned. We have seen that this structure generator - which started as foreground - gradually lost its power, becoming weaker and weaker until it was dropped completely. We also notice a formal transition: in the beginning ESPRIT alone, then in counterpoint with FIGUREN, and at last a polyphony of three different structure generators. Since the occurence of ARPEGGIO, however, a situation is established, where two modules are kept (BROWNCHORDS and FIGUREN) as a "memory" of the previous situation. With the entrance of JOYCE, FIGUREN is cancelled. Again we notice a formal shift, where two compounds of the recent musical situation are maintained, while a new aspect is brought into the game. The different structure generators are chosen by random - an already picked module is being blocked until all others are selected. Whenever GENERALPAUSE occurs, all active structure generators will be switched off, resulting in silence. By this the infinite process of Lexikon-Sonate will be articulated in "movements". Afterwards the sequence of weights will be mixed again (now - instead of 3-2-1 perhaps 2-3-1 in) which will serve as a formal principle for the next movement. stop: turns off the whole machine. The "control" box serves as a sort of conductor which gives cues to the structure generators, that are placed below. Clicking on the auto-toggle starts the simplest performance mode: the built-in conductor will entirely take control, selecting the structure generators in time and switching them on and off. If one wants to influence the behavior of the machine, one can click on the "add module" button. Whenever this is done, a new structure generator will be chosen by random and combined with the two others that are still active. Clicking on the "change weight" button will change the weight factors as they are applied to the module, determining whether a chosen module serves as a foreground, middle ground or background structure. This can be seen at the bottom of the display - the three boxes forming the "chain" that was discussed in the previous chapter. However, there are also more advanced levels of interaction. Instead of merely requesting a change to take place (by clicking on the "add module" button), one can decide at will, which modules shall be combined. This is achieved by choosing a module from the "select a module" pop-up menu, which will be sent into the combination chain. Furthermore, the sequence of weight factors can be determined, by selecting it from the other pop-up menu "select a sequence of weights". But one can also by-pass the combination chain which allows only three modules at a time to be played, and with different "weights". By opening a module itself (by double-clicking on its box), one can directly access its parameters, choosing various settings and all the possibilities of combinations. The fact that Lexikon-Sonate never repeats itself creates a challenge to invent a particular performance situation that utilizes its interactive facilities. The premiere took place on February 2, 1994 in the concert hall of the Austrian Radio as a live broadcast during the radio program KUNSTRADIO - RADIOKUNST. On stage there was the only the wonderful "Bösendorfer SE Grand Piano", but no player at all. The radio listeners (who were not sitting in the concert space) nevertheless had the possibility to interact with the computer program by dialing a certain telephone number. Whenever a call came through, Lexikon-Sonate would change its compositional behavior by adding a new and randomly selected module into its combination chain. In this way the totality of radio listeners would "govern" the form of the music, even though nobody could know the actual effect of their contribution. At a lecture I once asked two persons from the audience to come on stage and sit there, back to back, so that they could not see each other. By giving signs with their hands, they indicated when they desired a change in music. Although these persons could not see each other, they could hear when the other had required a change - this led to a situation where the both started to "play" with each other, resulting in a wonderful and energetic performance. 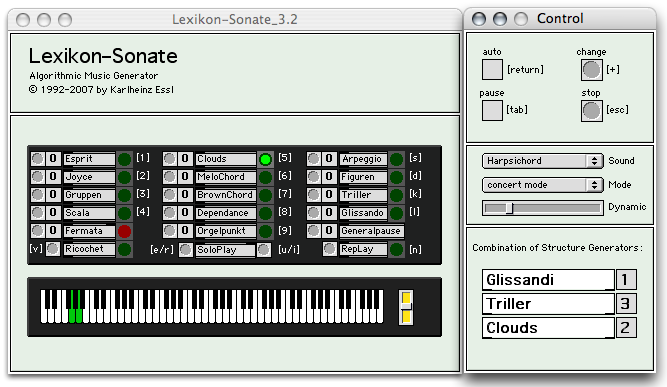 Recently, Lexikon-Sonate has undergone another transformation: since version 2.0 (released 3 March 1998) it appears also as a meta-instrument which allows one to play the piece by using certain keys of the computer keyboard. By hitting those specified keys, certain structur generators can either be triggered (like evoking one glissando gesture) or being switched on or off (like starting resp. stoping an ESPRIT melody). Here the borders between composition, performance, and instrument are absolutely blurred. I want to thank Robert Willey (University of California, San Diego), Dennis Patrick (University of Toronto, Faculty of Music), and Gerhard Eckel (IRCAM, Paris) for their discussions which were of help in formulating this article. Essl, Karlheinz (1989). Zufall und Notwendigkeit. Anmerkungen zu Gottfried Michael Koenigs Streichquartett 1959 vor dem Hintergrund seiner kompositionstheoretischen Überlegungen; in: Musik-Konzepte, 66 "Gottfried Michael Koenig". Munich: edition text + kritik. Essl, Karlheinz (1991). Computer Aided Composition; in: Distel, "Mensch Maschine", 46/47. Bozen: Distel Verlag. Essl, Karlheinz (1992). Kompositorische Konsequenzen des Radikalen Konstruktivismus; in: Positionen. Beiträge zur neuen Musik, 11. Henck, Herbert (1980). Karlheinz Stockhausens Klavierstück X. Ein Beitrag zum Verständnis der seriellen Kompositionstechnik. Cologne: Neuland Musikverlag, 19-23. Koenig, Gottfried Michael (1965). Serielle und aleatorische Verfahren in der elektronischen Musik; in: Die Sonde, 5 (1). Koenig, Gottfried Michael (1970). Project 1. Electronic Music Reports, 2. Utrecht: Instituut voor Sonology. Stockhausen, Karlheinz (1957). ...wie die Zeit vergeht...; in: die Reihe. Informationen über serielle Musik, 3. Vienna: Universal Edition. Information about a recording of Lexikon-Sonate as a Disklavier disk (which can be played on a Yamaha Disklavier) can be obtained from Bob Willey's website (CRCA Studio at the University of California, San Diego). CD Rudiments (1995 by Karlheinz Essl): excerpt of the premiere within the radio program Kunstradio (Vienna, 10.2.1994) featuring the Bösendorfer SE Grand Piano. CD Road to Chaos (1996 by Soundprint): excerpt of a concert (Toronto, 10.3.1996) featuring the Yamaha Disklavier. Interactive CGI Implementation: design your own version of the Lexikon-Sonate by combining its various structure generators as you wish. Karlheinz Essl, Composing in a Changing Society. Lecture given at the International Musicological Symposion Austria: 996-1996. Music in a Changing Society on 6 Jan 1996 in Ottawa, Canada (1995). - To be published in the proceedings of this conference in 1997/98. Clemens Hausmann, Kunstrezeption und ästhetischer Gegenstand. - Vierter Teil: Anwendung und Diskussion des Modells: Andreas Okopenko, "Lexikon-Roman" / Karlheinz Essl, Lexikon-Sonate (phil. Diss., Salzburg 1995). Karlheinz Essl, Plädoyer für "Das Offene Kunstwerk"; in: Positionen. Beiträge zur neuen Musik, ed. by Gisela Nauck, nr. 26 "Interpretation" (Berlin 1996). 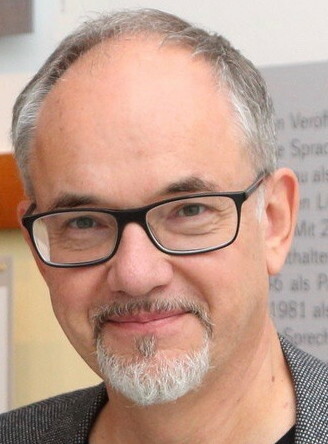 Karlheinz Essl, Strukturgeneratoren. Algorithmische Komposition in Echtzeit; in: Beiträge zur Elektronischen Musik (= Veröffentlichungen des Instituts für Elektronische Musik der Musikhochschule Graz), vol. 5 (Graz 1996) - ISSN 1024-5391.